It’s said that Sea Grant programs are built on a three-legged stool. Louisiana Sea Grant was established in 1968 with the first leg – research. Extension, the second leg, came along in 1973 with the hiring of the first Marine Extension agent. The third leg – K-12 education – formally became part of the program in the 1990s, although LSG had been involved in education projects since the mid-1970s. Since 1990, Louisiana Sea Grant (LSG) has had three education coordinators who worked primarily with K-12 teachers and students. Lyle Soniat was the first to serve in that position, followed by Pam Blanchard and then Dianne Lindstedt, who currently is in that post. In the mid-1970s, marine vocational-technical education programs existed in five of the state’s parish school systems. The programs emphasized skills needed by students for entry-level jobs in the working waterfront industries. Most students completing the programs found immediate employment as deckhands or in other similar nautical professions when they graduated high school. A vocational marine education program launched in Terrebonne Parish in 1971-72 began with thirty 11th and 12th graders. Enrollment rose to 300 the following year, with the 50 students scheduled to graduate in 1974 all having jobs lined-up in the offshore oil and gas or support boat industries. LSG supported the marine vocational program in Terrebonne by producing three nautical science textbooks to meet specialized training needs of the offshore marine support industry. During the late 1970s, another marine education project grew out of a serious imbalance in the content of nearly all K-12 instructional programs in the state. Too many instructional programs simply ignored Louisiana’s marine and wetland environments and traditions. Initially, Louisiana Sea Grant conducted teacher workshops (which are still offered today) in marine education, as well as sponsored courses in marine and wetland ecology for educators. LSG also developed a set of teaching materials called the Marine Studies High School Curriculum. The materials, divided into 19 modules, covered a wide range of marine topics. Each included a student text, teacher’s manual, set of tests, and a laboratory and field manual. From that collection, teachers could select one of more modules that harmonized with an instructor’s subject-matter interest. That way, a marine dimension could be added to a course with little or no change in basic instructional programs. “The impact of that curriculum is still lasting today because we still have it in the State of Louisiana educating students at the high school level,” said Jim Barr, who worked with LSG from the 1970s through the 1990s and helped develop the materials. 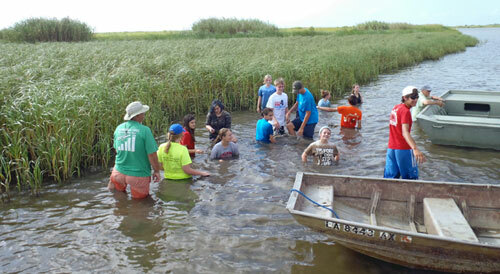 Marsh Maneuvers is a four-day camp for high school 4-H Club and Junior Leadership members currently held each summer at or near the Rockefeller Wildlife Refuge in Grand Chenier. Typically, 64 students from across the state attend one week of the month-long program each July. Since the program’s inception more than 20 years ago, it has become well known for its hands-on educational activities related to coastal ecology, wetland loss and key social issues affecting the health and economic well-being of Louisiana’s coastal communities. “The kids arrive at Rockefeller Wildlife Refuge on Monday afternoon and from that point on, it’s pretty much action-packed,” said Mark Shirley, who founded the program. Shirley is a Marine Extension agent with LSG the LSU AgCenter. “We take them on night hikes to shine some alligators and look at some of the animal activity at night. During the day Tuesday and Wednesday, we do some crabbing and fishing and look at some water control structures. We talk about restoration projects such as bank stabilization and oyster reef development. We do some biology stuff by looking at alligators. We dissect some fish heads to remove the otoliths. And we talk about how biologists use that as an aging technique for fish,” Shirley added. More than 600 high school students have participated in the program since its inception. March Maneuvers is hosted by the LSU AgCenter in cooperation with LSG and the Louisiana Department of Wildlife and Fisheries (LDWF). Blanchard developed Coastal Roots in 2000 with the late Dave Bourgeois, who was a Marine Extension agent for Louisiana Sea Grant and the LSU AgCenter, and Ed Bush, an AgCenter horticulture professor. LSG has supported the project since its beginning. Currently, there are 56 schools across 21 Louisiana parishes participating in Coastal Roots, as well as four schools in Chile. Although LSG is still supportive of Coastal Roots, the program now is housed in the LSU College of Human Sciences and Education. Ocean Commotion offers K-8 students an opportunity to learn about a host of issues that range far beyond ocean-exclusive themes in a lively, hands-on learning environment. Topics include coastal marshes and wetlands, invasive species, local ecosystems, boating safety and Louisiana geology and wildlife. Typically, 60 or more exhibitors from private business; Louisiana, Mississippi and Alabama universities; government agencies; and public and private non-profit educational organizations, as well as some students from 4th to 12th grade, have booths at the coastal stewardship fair. “It’s a great experience for the students,” said Lindstedt. With the first Ocean Commotion being so successful, Sea Grant and LSU University Relations agreed to go forward and do it again and again and again. In 2017, the 20th Ocean Commotion was held. Many things have changed since the first Ocean Commotion – the one-day event is now directed exclusively by LSG – but it remains a lively, hands-on learning opportunity. Native Fish in the Classroom is a year-long education project that has some similarities to Coastal Roots. Sea Grant Education partnered with LDWF’s Angela Capello on this fisheries stewardship project since its beginning, where students from 17 middle and high schools hatch and grow paddlefish for release into the wild by LDWF. “The goal of Native Fish is to help students to develop an attitude of stewardship toward Louisiana’s natural resources, and to provide them with a constructive active learning situation in which they can explore strategies for sustaining our aquatic ecosystems,” said Lindstedt. Paddlefish are an ideal species to use for studying fish growth and development in the classroom because their life cycle parallels the academic year. Paddlefish have large eggs which makes observing cell division exciting once the egg is fertilized. Paddlefish fry grow about one inch per week and reach about four inches in less than two months. So, students can observe three distinct life stages. “By participating in the project, teachers and students really do contribute to LDWF’s paddlefish restoration project. At the department’s hatchery, the fingerlings are tagged and released into the Atchafalaya River drainage basin system. The fish population is then monitored on a yearly basis by LDWF biologists,” she said. In 2010, 15 Scotlandville Magnet High School students began broadening their science education through the EnvironMentors chapter established at LSU in partnership with the College of the Coast and the Environment. The program increases students’ environmental awareness and encourages them to pursue science, technology, engineering and math careers. Although Scotlandville High is a magnet school, the EnvironMentors students are not part of the engineering magnet program. EnvironMentors students visit the LSU Baton Rouge campus twice a week where they meet with their graduate student mentors, learn how to work in a science laboratory, use a college library, conduct basic research, as well as visit museums, aquariums and participate in other field trips. Several of the LSU EnvironMentor students have traveled to Washington DC to present their research in an annual poster competition and have won college scholarships worth as much as $10,000. The LSU chapter was also named 2018 EnvironMentors Chapter of the Year. EnvironMentors was established in 1992 in Washington, D.C., and now has 13 chapters at universities around the country. Louisiana Sea Grant’s 2011 Knauss Fellow, Lauren Land, and NMFS/Sea Grant Marine Population Dynamics Fellow, Melissa Hedges Monk, wrote the grant to establish the LSU chapter. Watch the Delta Grow (www.watchthedeltagrow.com) is a collaborative, educational project established by LSG and the LSU Coastal Sustainability Studio to raise awareness about the rising Wax Lake Delta. Scientists study the area using a myriad of tools and technology to track, record and monitor the environmental conditions of the delta throughout the seasons. These observations provide the opportunity to better understand natural deltaic systems and in turn help inform coastal restoration efforts. The Watch the Delta Grow website serves as an outreach tool where some of the data collected from the delta is placed into the hands of middle and high school students. Blanchard, associate professor in LSU’s School of Education, is instrumental in editing and reviewing Watch the Delta Grow lesson plans. “I want the science to be interesting and relevant to the students — I want students to be drawn into science, not afraid to dig deeper,” she said. Education activities listed here are a fraction of LSG’s overall impact during its nearly a half-century existence. We would like to hear of your experiences with Louisiana Sea Grant – which is celebrating its 50th anniversary in 2018. You can submit your comments to www.surveymonkey.com/r/BLR3CG2, as well as photos you want to share. Comments and photos will be featured during an anniversary event in the Fall of 2018, and also may be shared throughout the year online. To learn more about the founding of Louisiana Sea Grant, visit www.laseagrant.org/2018/lsg-marks-half-century/.